I first came across the Quiz Night about four years ago when it was held at The National Brewery Centre. Alexander Accountancy then brought it back at Branston Golf and Country Club two years ago, seeing it as part of our Corporate Social Responsibility when we raised £3,000 for Burton YMCA. After joining the Burton District Chamber Council in 2017 I asked the Chamber to adopt this as an annual event which they have done. Last December over £4,000 was raised by the 24 teams of 6 that took part, shared between three local charities. Last year it was won by (us) the Alexander Accountancy works team. So in true tongue in cheek Olympic style I would like to invite members of our local business community to put in a team together and try to take away our bragging rights. On a more serious note I do believe Corporate Social Responsibility should be important to every business from sole traders to the corporate giants. And the Chamber forums are where we can all mix and this can all come together. 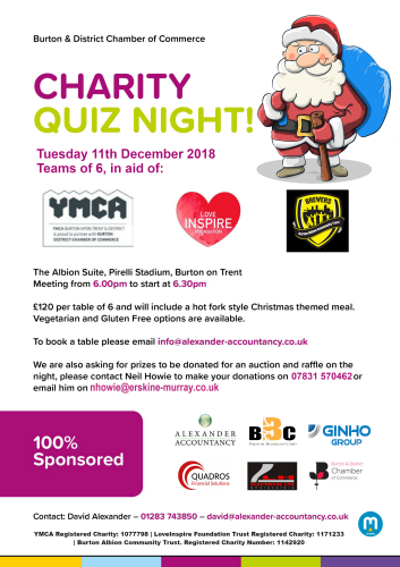 This year the quiz is in aid of Burton YMCA, Love Inspire Foundation and the Burton Albion Community Trust, which I think is a good mix as it includes the homeless, children and the community. All of whom we should be thinking about and trying to support. And the quiz allows us to do this in a fun way that includes good food and good company. This year the event is very much a team effort, Neil Howie of Erskine Murray is putting in a storming effort in finding sponsors, recruiting teams and gathering auction and raffle prizes. Pam Wallis of the Chamber is taking charge of the hosting team who are the real hero’s as it is their efforts that allow the rest of us to enjoy the evening. 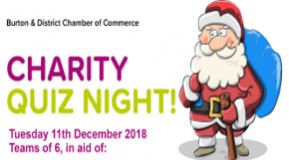 Andy Rudkin of Else Solicitors will be our host and MC for the night, Richard Lloyd of CMC Partners will once again be acting as the quiz master, plus there will be close magic performed for your entertainment by the award winning Eddie Young. I would like to stress that all the funds raised from entry fees and activities on the night go to the Charities so please be generous. The cost of the event is covered by the sponsors. I would therefore like to thank the other sponsors who are Burton Business Club, the Chamber of Commerce, Ginho Group, LH Electrical and Quadros Financial Solutions. There are thank you’s to Ben Robinson and Burton Albion for providing the venue, another mention for Richard Lloyd of CMC Partners for sponsoring the warm up round, and Tim Rees of Midweb Services for his efforts behind the scene in helping to publicise and promote the event.